Anybody who took trips to foreign countries before the end of the previous millennium was generally left with a pile of leftover foreign currency. The coins and bills were of different size and mintage, were of various colors and featured different images – they were often collector items! The introduction of the euro brought an end to these differences, the tedious calculations and exchanging cash – within many European countries at least. In the meantime, some have been calling for society to go one step further and completely do away with coins and bills, replacing the traditional forms of payment with electronic payment solutions (e.g. please see: capital.de). This vision of the future is still some way from becoming a reality of everyday life in Germany. At the moment, nearly all Germans carry cash on them when leaving the house. Just 10% of Germans rely exclusively on card or smartphone payments when on the go. However, nine out of ten respondents attested to the fact that they always have cash on them. 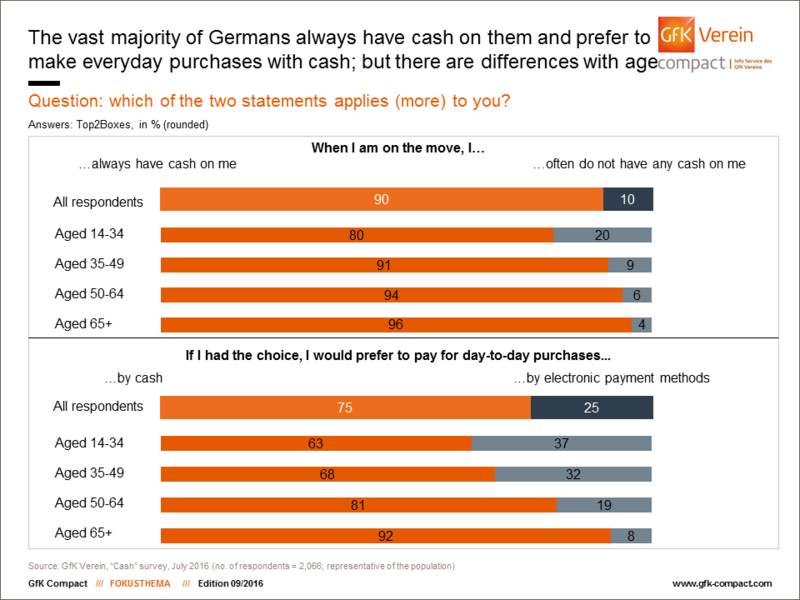 These are the results of a survey conducted by GfK Verein in July 2016, in which 2,066 (representative of the German population) people were asked questions relating to the subject of cash. However, loyalty to cash does vary with age, fluctuating between 80% and 96%. One-fifth (20%) of respondents aged 14 to 34 often do not carry cash when leaving the house. This proportion quickly falls as the age group of respondents rises: Just 9% of respondents aged 35-49, 6% of those aged 50-64 and 4% in the 65+ age group do not carry cash when leaving the house. unambiguous in their preference: 92% would opt for cash payments despite the availability of other payment solutions. As far as the fundamental possibility of cashless payments is concerned, the respondents’ attitudes are just as clear: If there were to be a referendum on abolishing cash – obviously under the condition that cashless payments would then be possible everywhere, including in small shops and between individuals – the majority of Germans would not vote to abandon their familiar cash payments. 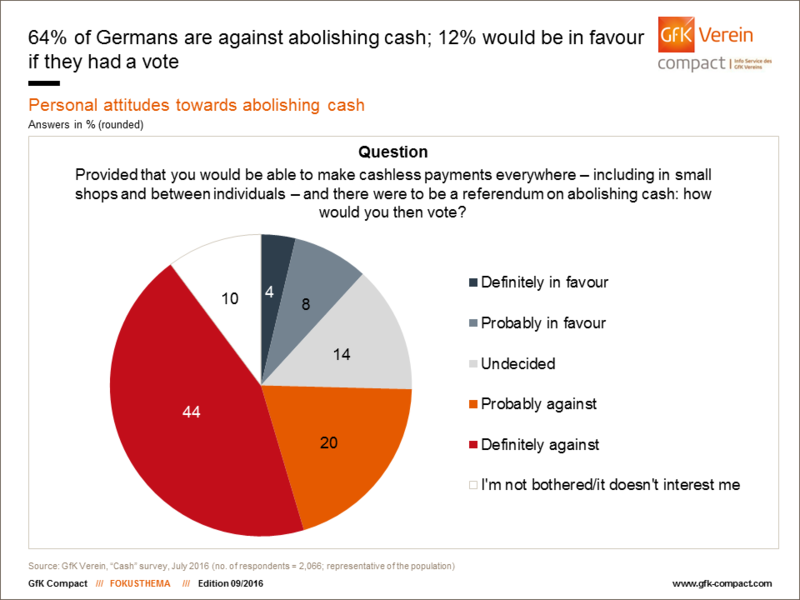 In this hypothetical referendum, 64% of Germans would be more or less expressly against abolishing cash (44% definitely against, 20% probably against). A total of 14% are able to see both sides of the argument, identifying both advantages and disadvantages in this scenario. And an additional 10% are totally indifferent to the debate for and against cash. Just 12% would probably (8%) or even expressly (4%) be in favor of implementing a completely cashless society. between 14 and 34 years old who have grown up with digital technology. 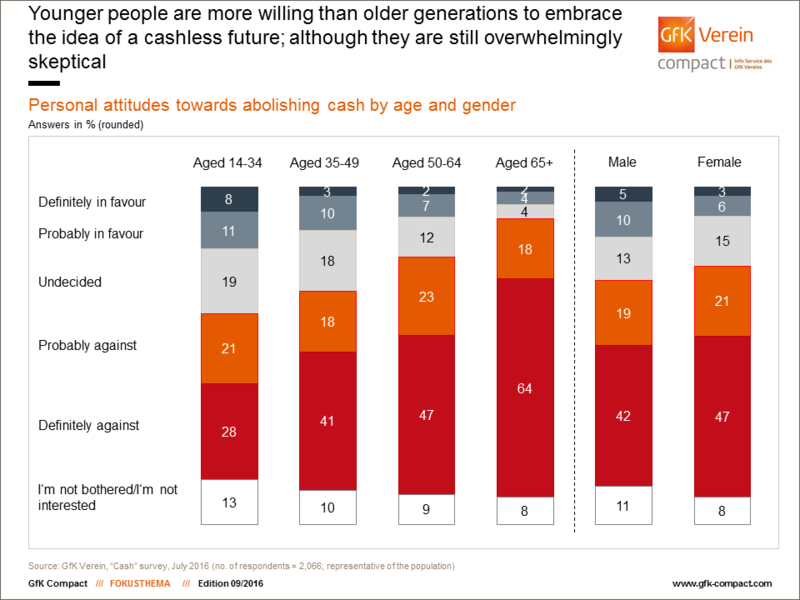 They represent the age group most in favor of a cashless future, with 19% supporting the idea. Interestingly, this group also contains the most uncertainty (19% of respondents undecided) and comparatively high numbers of respondents who are indifferent (13%). Anyone who thinks that the generation of digital natives are ready to abandon their physical currency is mistaken. A total of 49% of this age group are still against abolishing cash as a payment method. The younger respondents are obviously hesitating as they consider whether they would want to live in a society where they can pay for everything by card or smartphone: from breakfast and cinema tickets, to coffee to go or a round of drinks in a bar. A glance at the gender differences reveals that men are somewhat more in favor of a move towards a cashless future than women. A total of 68% of women would prefer to keep cash. However, the majority of men (61%) are also against abolishing cash. Who hasn’t encountered this situation? You are just wandering aimlessly around town, when you suddenly stumble upon your dream pair of shoes or the latest smartphone in the sale. All without really even looking. Card payment enables you to make a spontaneous purchase without having to run to an ATM to withdraw money. Happy days. However, it can also be the case that you regret the purchase afterwards, as you may have exceeded the account’s credit limit for the month, for example. With cash this does not happen. “Expenditure control” plays an important role in terms of the reasons for and against abolishing cash. Curiously, this argument in posited by both advocates and critics of a potential abolition of cash. Both sides claim that their stance offers people a more convenient overview of their expenditure. However, this reason ranges from the very top among opponents, at 30%, to very low down the advocates’ list, at just 6%. Furthermore, a third of opponents to abolishing cash use a purely emotional aspect in their reasoning: we are used to cash, like to have some on us and we are comfortable with it. The data protection argument is also used as a major reason in this debate: 17% fear that, in moving away from cash, we would become transparent customers, with all financial transactions traceable by third parties. A total of 14% of cash advocates state that cash is simply better suited to certain scenarios: tipping, birthday money, piggy banks and holidays, for example. Overall, 12% maintain a position of general skepticism towards the feasibility of implementing a cashless society, while 10% believe this would involve a restriction of our freedom or even disenfranchisement. They clearly value holding onto the free choice between all options. There are also worries for 6% about security in terms of misuse/abuse when bank or credit cards are lost. A total of 5% fear that certain target groups would be disadvantaged. Socially disadvantaged citizens, the older generations in general, children and educating the public on handling money are cited in this context. The fact that cash is just simpler or less awkward than other payment methods is given as a reason by 3% of respondents who reject the notion of a cashless society. Interestingly, the risk of negative interest rates, which are a hot topic among experts in public discussions at the minute, was not explicitly named by any respondents. Just 0.8% complained that people would then be unable to save money at home. 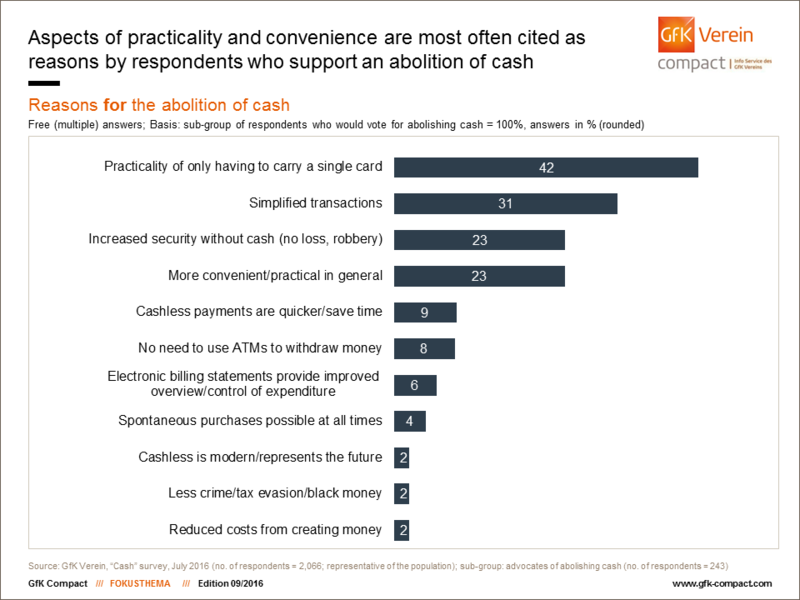 The majority of arguments presented by advocates of abolishing cash are pragmatic in nature, centered on personal comfort: 42% find it practical to only have to carry a single card in their wallet or purse, 31% expect transactions to become more simplified in general, 23% believe cashless payments to be more convenient and practical in general, without citing specific aspects, and 9% expect that exclusively electronic payments would be quicker and save time. Not having to go to an ATM is an advantage for 8% of respondents in favor of a cashless society, while 4% cite the way in which spontaneous purchases would be made easier. A further 23% believe electronic payment to be more secure, as they would not lose cash and could not be robbed. And 6% present the argument – as previously mentioned – that electronic billing statements provide you with an improved overview of your expenditure. However, one argument commonly proffered by experts, was used surprisingly seldom by respondents here: Fighting crime registered just 2%, and was therefore way down the list for supporters of a cashless society. Whether or not cash will survive in the long term, or die out over either the short or long term in Germany as well, remains to be seen. However, one thing is for sure: German consumers currently have a strong affinity to cash, regardless of the arguments presented for or against by politicians involved in matters of security and economic experts. We only have to look at the example of Sweden to see that it can go another way. “Cash takes a backseat <there> in terms of its role in day-to-day life. You can’t pay with cash in many subway stations and on buses, or in museums and bars. Many churches have even replaced their collection trays with what is known as a “collect-o-mat” which can accept credit card donations”, an article published on finanz.net this June reveals. Moreover, a report on “Sveriges Radio”, Sweden’s foremost radio station is quoted, which predicts that cash will have practically disappeared from Swedish society by 2021. If you have any queries concerning this study, please contact Claudia Gaspar (claudia.gaspar@gfk-verein.org) or Anja Dieckmann (anja.dieckmann@gfk-verein.org).